The first Bioglitter® product developed by Ronald Britton Ltd. THE ORIGINAL GAME CHANGER. Cosmetic Bioglitter® SPARKLE, uses our unique plant derived film to offer an eco friendly glitter without equal in the industry and represents our brightest effect Cosmetic Bioglitter®. The product has been independently proven to biodegrade in the natural environment and is antimony free. Because of its cellulose content, it is softer than traditional glitter, making it extremely comfortable when on the skin. Cosmetic Bioglitter® SPARKLE is not edible. Already 92% plastic free and we are working to remove the last bit of plastic to become totally plastic free. 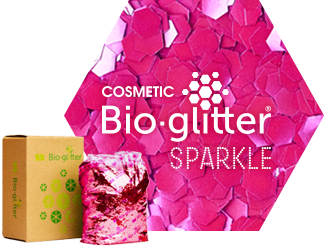 This will improve the biodegradability performance, allowing Cosmetic Bioglitter® SPARKLE to become certified as Cosmetic Bioglitter® PURE is already.